On Good Friday, the Friday before Easter, Christians commemorate the crucifixion of Jesus Christus, the son of god. 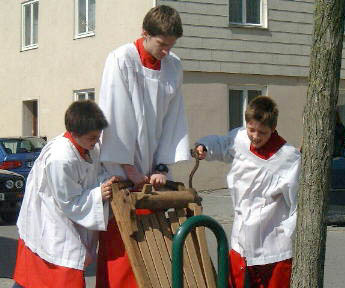 Because of this reason on this day the church bells in Wartenberg, Upper Bavaria are not rung. Instead the believers are called to go to church at 3 p.m. by a specially big rattle. recorded on Good Friday, April 21rst, 2000.